Seriously, John Boehner is like, What? The Koch brothers are all, No, don’t impugn what we do like that. Virginia ran the ball 39 times for 116 yards, which comes out to 2.9 yards per rush. 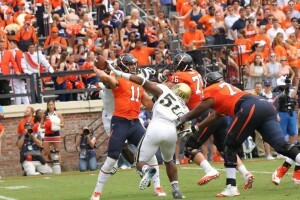 Starting quarterback Greyson Lambert threw 23 passes that produced 112 yards, 4.8 yards per clip. Backup Matt Johns, who led a spirited ‘Hoo comeback in the second half, was more efficient, throwing 22 passes that produced 154 yards, but three of his completions accounted for 84 of those yards, meaning the other 19 produced 70, 3.6 yards per attempt. Dive up the middle, screen to a running back, screen to a wide receiver, dump-off to the flat, quick hitter over the middle. It was maybe the most unimaginative UVA offense we’ve ever seen, and we had to endure how many years of the Mike Groh era? The frustrations came to a head after a fourth-down conversion gave Virginia a first down at the UCLA 19 inside of four minutes to go in the game and the ‘Hoos in need of a touchdown and two-point conversion to tie the game. The ensuing set of downs went like this: Khalek Shepherd up the gut for a yard, Johns on a keeper for a loss of two, Taquan Mizzell back up the gut for a gain of two, then on fourth down Johns incomplete on a pass to Doni Dowling that would have been short of a first anyway. Head coach Mike London inexplicably threw Johns under the bus for the maddening third-down play call, saying the play signaled to Johns was a pass, which Johns confirmed (nice job, Coach London, because we wouldn’t have known that the third-stringer flubbed that until you told us, but hey, the heat is off you, so congrats). But even so, first and second down were apparently executed the way Fairchild wanted, putting Virginia behind the chains for the third-and-long in the first place. In addition to blaming Johns, London went out of his way to defend Fairchild. It honestly looked at times like the game plan was to play it so vanilla that the contest would go to overtime knotted at zero, and the UVA defense did its part to get things in that direction, limiting the UCLA offense to a single scoring drive among the 16 drives that the Bruins, led by preseason Heisman Trophy short-lister Brett Hundley at quarterback, had on the day. That the Cavs spotted the Bruins three touchdowns with a pair of pick-sixes thrown by Lambert and a long fumble return and still was in a one-play game most of the second half actually speaks to the potential success in the future of the strategy. Avoid turnovers, and Virginia shocks the world at the end of the day. Which is to say, expect to see more of the same from Fairchild and London. With a quarterback controversy looming, it’s not like it would make any sense whatsoever for the brain trust to open up the playbook to try to play pinball-style football. The final result Saturday wasn’t what it could have been; Virginia should have walked away from that game with the monumental upset. But what we saw was a team that can play monster defense, and if the offense can just put a couple of scoring drives together and avoid mistakes the rest of the day, UVA football can win some games in 2014. That might not be what you want to hear, but it’s the only way Virginia can have success this year.